400,000 miles? With Jiffy Lube, it’s possible. 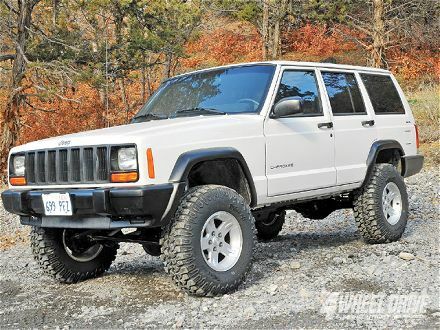 HOUSTON – Roy Lindahl has been driving his white Jeep® Cherokee since the day they drove off the lot together seventeen years ago. He and his vehicle, affectionately nicknamed “Jeepy,” recently reached a major milestone when the odometer hit 400,000 miles. It was a proud moment for Lindahl, who has kept Jeepy on a regular preventive maintenance schedule for years to ensure his reliable companion takes him where he wants to go for years to come. It’s been a habit well practiced for Lindahl, who has surprised even maintenance technicians with his Jeep’s impressive condition and mileage. An auto mechanic as a teen, and engineer by trade, Lindahl has seen the impact that neglect can have on a vehicle first hand and he has passed the importance of proper maintenance on to the next generation. His son, who has inherited his passion for vehicles, recently showcased his own restored vehicle in a hometown parade and practices the same dedication to maintenance. It’s no surprise that Lindahl and his son are not the only drivers looking to hold onto their vehicles as long as possible. A recent survey conducted by Jiffy Lube International (JLI) reveals that more than half of U.S. drivers hope to have more than 150,000 miles on their vehicle before replacing it, and more than a quarter aspire to clock 250,000 miles or more. The impact of more difficult economic times can be seen in many places including on the road. The average age of a vehicle on the road continues to rise year after year. According to the Bureau of Transportation Statistics, the average automobile in operation has aged almost three years since 1990†. In addition, the majority of vehicles on the road (at nine years old) have logged 110,000 miles, according to NPD’s Car Care Trac. As drivers hold onto their vehicles longer, they are looking for better and easier ways to help protect their vehicle’s life. The JLI survey reveals that though drivers universally acknowledge that regular maintenance can help extend the life of their vehicle, many are looking for more out of their maintenance experience. In their desire to extend the life and value of their vehicle, drivers are seeking convenient ways to help them maintain it. More services and convenience are top priorities, with nine out of 10 people surveyed agreeing that having other key vehicle parts and fluids checked during their regular oil change is the most convenient way for them to help preserve their vehicle’s value. 86% are looking for vehicle essentials, including brake fluids, belts, exterior lights and wiper blades to be inspected, however only three-quarters leave with these services actually performed. Nearly one in five Americans believe the most important thing when having their oil changed is being able to have multiple services performed in a single visit, and more than half (59%) want to have their oil changed in 30 minutes or less. For drivers seeking a convenient way to help extend their vehicle’s life, a regular preventive maintenance regiment is essential. Jiffy Lube offers the Jiffy Lube Signature Service® Oil Change to address these needs, providing drivers with much more than just an oil and filter change. The service includes changing, inspecting, checking/filling and cleaning key vehicle parts and fluids and offers drivers a quick and convenient way to maintain their vehicle. The Jiffy Lube Signature Service® Oil Change is a convenient solution that can help drivers preserve the value and longevity of their vehicle. Keeping a vehicle alive and running beyond its years has long been a source of pride for vehicle owners – particularly in tough economic times. Whether the odometer is sporting double or triple digits, like-minded enthusiasts now have a place to pound their chests and celebrate their high-mileage accomplishments at a new Facebook community, “Keeping My Ride Alive.” Visitors can cruise the site to browse photos and stories from other high-mileage drivers, or share their own photos and stories. Newbies to the road, high-mileage heroes and everyone in between are welcome to join the community by “liking” the page and uploading their vehicle’s image and story. Visit www.Facebook.com/KeepingMyRideAliveto share your story and read about others. To find a Jiffy Lube service center in your area, please visit http://Locations.JiffyLube.com/. Visit JiffyLube.com to find oil change coupons and promotions, Jiffy Lube news articles, community involvement programs and events, franchise information and employment opportunities. The Jiffy Lube International survey was conducted via telephone interviews during the period of April 8-11, 2010. The survey included a national probability sample of 1,013 adults comprising 507 men, 506 women 18 years of age or older, living in the Continental United States. The survey was conducted by Opinion Research Corporation. Jiffy Lube International Inc. (“Jiffy Lube”), with more than 2,000 franchised service centers in North America, serves approximately 24 million customers each year. Jiffy Lube pioneered the fast oil change industry in 1979 by establishing the first drive-through service bay, providing customers with fast, professional service for their vehicles. Headquartered in Houston, Jiffy Lube is a wholly owned, indirect subsidiary of Shell Oil Company. Visit www.JiffyLube.com to learn more about Jiffy Lube and vehicle care. Royal Dutch Shell plc is incorporated in England and Wales, has its headquarters in The Hague and is listed on the London, Amsterdam, and New York stock exchanges. Shell companies have operations in more than 100 countries with businesses including oil and gas exploration and production; production and marketing of Liquefied Natural Gas and Gas to Liquids; manufacturing, marketing and shipping of oil products and chemicals and renewable energy projects including wind and solar power. For further information, visit www.shell.com.